Always on the go, the food truck business is rolling strong and booming with new flavors, creating convenient varieties of specialties and attracting loyal fans. More than creative themes, splashy colors and clever puns, food trucks across the country are blending modern styles and traditional cuisine, serving up their own distinctive spins on breakfast, lunchtime and dinner classics. Often using social media to share their ever-changing locations, these food trucks can be found in and around town or combing local neighborhoods… So your new favorite meal might be (literally) just around the corner. This gallery features innovative food trucks across the USA with unique offerings and a hodgepodge of gourmet fare from the roadway — all coasting along with an abundance of originality. 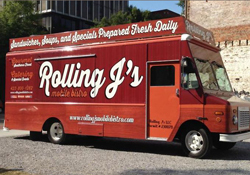 In Chattanooga, Tenn., Rolling J’s Mobile Bistro puts a New Orleans-style spin on the humble turkey sandwich. 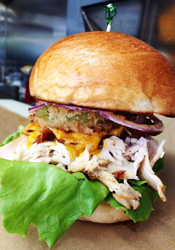 The Cajun turkey club is created with smoked bacon, cheddar cheese, red onion, fried green tomatoes and local hydroponic lettuce drizzled with Rolling J’s exclusive “Truck Sauce,” on a toasted bun.